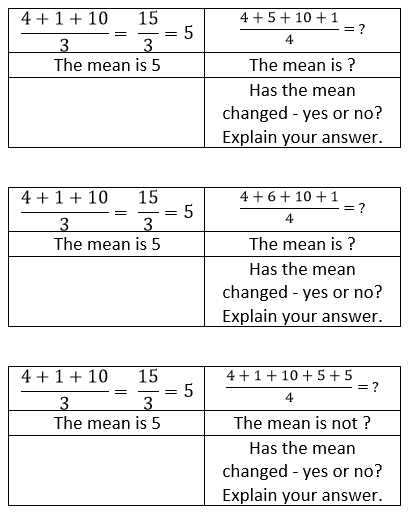 In my last post, I discussed whether an instructional programme could be created to teach a deeper concept of mean. I mentioned five different properties. After a conversation with Kris Boulton about the blog post, he spotted something interesting about property 5. Property 5: The average is only influenced by values other than the average. At the end of my previous post, I explained property 5. It is because when we add the average value to the data set then the resulting sum is divisible by the mean. When we add a value that is not the previous average, the resulting sum is not divisible by the new denominator. However, the second sentence is incorrect. If I do not add the average value of the original data set, I can still have a resulting sum which is divisible by the new denominator. The third example shows this. Example 1: Original data set with a mean of 5. Example 2: Add the average value to the new data set – resulting sum is divisible by the new denominator. The mean has not changed. Example 3: Not adding the average value to the new data set – resulting sum is still divisible by the new denominator. The mean has changed. Is there another way to communicate this property? This is an idea from Kris which he discussed as a potential second attempt to communicate property 5. It communicates property 5 nicely. It also has non examples too. If I do not add the average value then the mean is not 5. Below is another example that can go along with the example above because the average value (19) is not a number in the original data set. Pupils are then seeing an example where the average value can be present in the data set, and where the average value will not be a number in the data set. I have added the average value to the original data set. The mean has not changed. I added the average value twice to the original data set. I have not added the average value to the original data set. I think both examples are important to use because they communicate the same property. The second example communicates the message in a more explicit fashion. The first example should be included because it is a nuanced example compared to the second. This may or may not be that important, but telling a pupil that the average value can be a number in the original data set is knowledge a pupil should know. 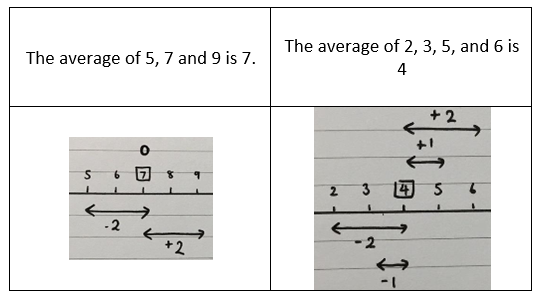 I wanted to convey an example where the procedure of dividing by the number of values was visible to pupils. However, at the same time, what is the most important aspect is pupils seeing that we have added the average value and the new average hasn’t changed. The division isn’t adding the value that I initially thought it was. The new examples communicate a quality of sameness that can clearly communicate the property effectively. Also, showing the features of the new data set which are permissible to be a positive example, and the non examples show the features of the data set which are not present to be an example for property 5. Many pupils are taught how to calculate the arithmetic average (the mean.) They are also taught a shallow understanding of the concept: it goes along the lines of “the mean is a calculated ‘central’ value of a set of numbers.” Or pupils have a very loose understanding of ‘average’ as colloquially referred to as ‘on average’. This is a start, but can an instructional programme be created to teach a deeper concept of the mean, accessible even to young pupils (8-14)? If so, it will aid future understanding of the weighted average at GCSE level. Furthermore, it will lay the groundwork to understand how the trapezium rule approximates the area beneath a curve, at A Level. In Strauss and Efraim (1988) seven properties of average are outlined and these properties were chosen to be discussed because “they are fundamental, and tap into three aspects of the concept”. I’m going to discuss what I think are the five most important. The average value of a set of data cannot be smaller than the minimum value or larger than the maximum value of the said data set. This seems like common sense to an adult but expertise induced blindness underestimates the difficulty for pupils to understand this property of the mean. How can this be communicated to pupils? By example, show that the average value is never smaller than the minimum value or larger than the maximum value. The following true or false questions are testing a pupil’s understanding of the property rather than their procedural knowledge of calculating the mean. Property 2: The average is representative of the values that were averaged. Therefore, the average value represents all the values within the data set. This property ties in nicely with the third property. Property 3: The sum of the deviations from the average is 0. Each value in the data set is a certain distance away from the average value which is clearly understood from a visual example. If we total the distances between each value and the average value, that total will equal to 0. This helps pupils to visualise that the average value is central to all the values. This highlights that the concept of the average value is again the central value to values within the data set. Furthermore, this highlights that the average value represents all the values that were averaged (property 2). How do we communicate this to pupils? Outline how to find the distance between each value and the average value. Emphasise that I do (value – average value) and that the distance can be negative, if the value is smaller than the average value. 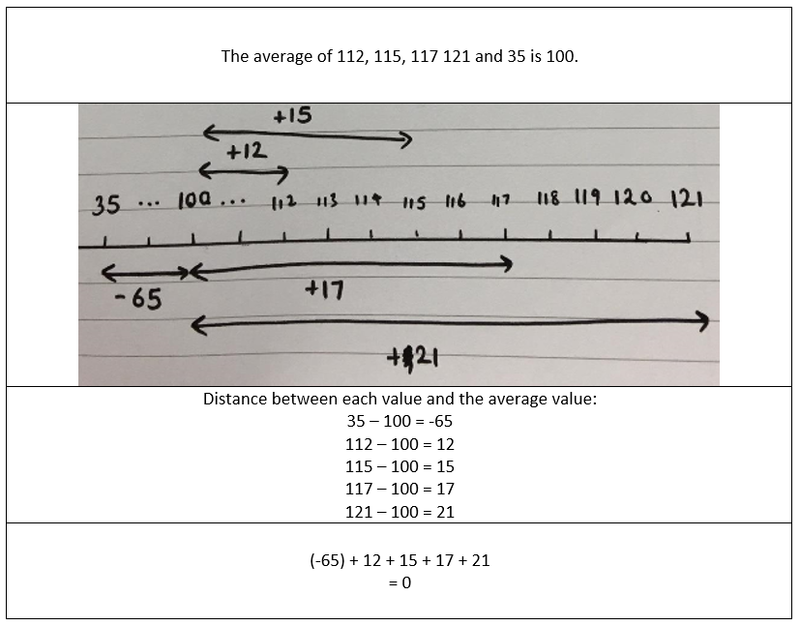 However, the pupils need to picture the distances. The sum of the deviations from the average is 0. The first question is asking pupils to apply their knowledge of finding the sum of the deviations for the average value. The second question is asking pupils to apply this knowledge but then decide which of the following data sets has the correct average value. Property 4: When one calculates the average, a value of 0, if it appears, must be taken into account. Dylan Wiliam has an excellent hinge question that deals with this property very well. Pupils often think they don’t have to include a 0 value when calculating the mean. A good way to overcome this is to simply include it in one of your examples. 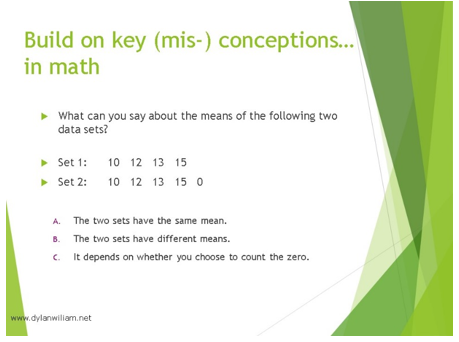 Seeing this in a concrete context also allows pupils to see why 0 must be included as a value in the data set. Sarah collected some money from her three siblings to raise money for charity. Hannah donated £5. Adam donated £7. Clare donated £9. Sarah did not donate any money. What was the average amount of money each of her siblings and Sarah donated? Adding a value to a data set which is equal to the average value of the current data set does not influence the new average. Because when we add a value that is the previous average, the resulting sum is divisible by the new denominator. How can we communicate this to pupils? The worked examples above show how the mean does not change when you add the average value of the previous data set (going from example 1 – 2 and 2 – 3). The last example shows that the mean does change when a value which is not the average of the previous data set is added. Decide if the mean has changed by adding a value. Explain that we have added a value which is equal to the average value. Adding the average value does not influence the values being averaged. At the end, I would explain how when we add the average value to the data set (5), we get a sum which is divisible by the denominator (20/4 = 5). When we add a value that is not the previous average, the resulting sum is not divisible by the new denominator. In summary, these properties of arithmetic average can be taught effectively with the correct worked examples and problem exercises which communicate each property at one time. It gives pupils a spatial understanding of the mean which is above and beyond the procedural calculation of calculating the mean. I think it is highly powerful knowledge that can lend itself for more complex understanding of the mean when learning about the difference between simple mean and weighted average mean.